It’s been a right Royal 122nd Devon County Show! Devon came out in force for the 122nd Devon County Show which ended yesterday (Saturday). Crowds flocked to Westpoint showground near Exeter to be part of the county’s largest annual event. Among the visitors was HRH The Countess of Wessex who gave this year’s Devon County Show a royal glow as she met hundreds of people and animals during a two-day visit. The Countess, as President of the Devon County Agricultural Association which stages the Show, spent Thursday and Friday at the Show and even attended the Stockmans' Supper, a thank you to the exhibitors and livestock competitors. She met farmers, school children, farming organisations, food and drink producers, joined the launch of a one million pound village halls campaign, a Young Farmers’ Club farm safety initiative and carried on regardless in spite of an occasional shower. Show Secretary Ollie Allen it had been a delight to introduce HRH to some of the very many people involved in rural life in Devon. “HRH is genuinely interested in those who are involved in the Show and thoroughly enjoyed talking to everyone from livestock farmers to school children. One of the highlights of the Show was created by the people of Devon who hand-crafted more than 33,000 poppies as a tribute to the men and women of the county who lost their lives in the First World War. After the poppies will be safely stored until they are displayed in Exeter Cathedral in November. Farming is at the heart of the event and there were visits by farming minister George Eustice, CLA President Ross Murray and NFU President and Vice President, Meurig Raymond and Minette Batters respectively. Devon farmers enjoyed great success in the Show ring scooping the blue riband of the Show's livestock classes, the interbreed cattle championships. Michael and Melanie Alford, of Foxhill Farm, near Cullompton, carried off yet another top prize at a major show, as their two year old in-calf Limousin heifer, Corranhill Krystal, took the interbreed championship for beef cattle. The reserve beef champion was Waddeton Hilda 78, an eight-year-old South Devon cow, bred and shown by renowned South Devon breeder, Gordon Tully, of Waddeton Barton near Brixham. The Holsteins took the dairy interbreed, in the shape of five year old Curscombe Windbrook Joy 89, bred by Mrs Jenny Bishop of Feniton in East Devon, and shown by her daughter Nicola Lockyer. The cow was reserve champion at last year's Royal Cornwall Show. Reserve champion was a Jersey cow shown by Mark Davis, Windyridge Tequila Diamond, of the Davis family's Rivermead herd from Tiverton. Both Nicola Lockyer and Gordon Davis are formers winners of Devon Farm Business Awards (DFBA) which recognise farming excellence. There was another prize for Devon when the Champion sheep competition was won by a Texel ewe shown by Paul Quick, of Zeal Monachorum in Devon. Meanwhile the Champion pig was a Tamworth sow, shown by Andrew and Emily Brown, from Winsford in Somerset. This year’s big winners of the DFBA were Colin and Glenys Latham of Higher Stowford Farm near Ilfracombe who were awarded the titles Devon’s Farmer of the Year and Best Commercial Farmer. In the Food and Drink Pavilion Michelin-starred chef Michael Caines from Lympstone Manor was in the kitchen on two days along with many other local chefs and food producers. It takes 400 volunteer stewards and 40 Girl Guides to support the small team of staff to stage the biggest annual event in Devon. Among those volunteers was newly-wed Girl Guide leader Hannah Richardson, aged 29, from Plymouth. Hannah, aged 29, is so dedicated to supporting the Show that she and husband Lawrie timed their wedding so she was available to come to the Show for the 14th year in succession. Joining the young volunteers were graduates and undergraduates who ran All Points West, an online Show newspaper. They photographed, blogged and videoed stories which caught their interest and their material can be accessed via the Show’s website. 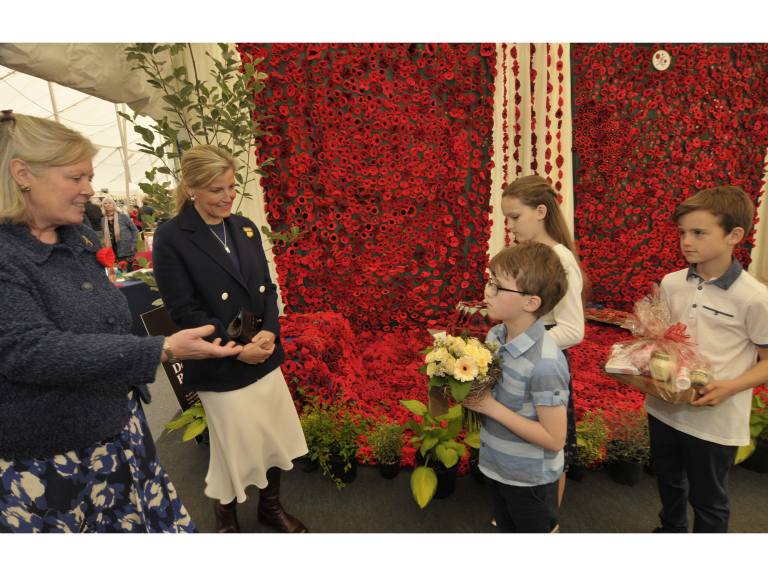 Photo caps: Poppies presentation – HRH The Countess of Wessex received gifts from Charlie (eight) and Sophie (11) Moore and George Morrison, aged nine accompanied by Deborah Custance Baker, Chief Steward of the Crafts & Gardens Feature. 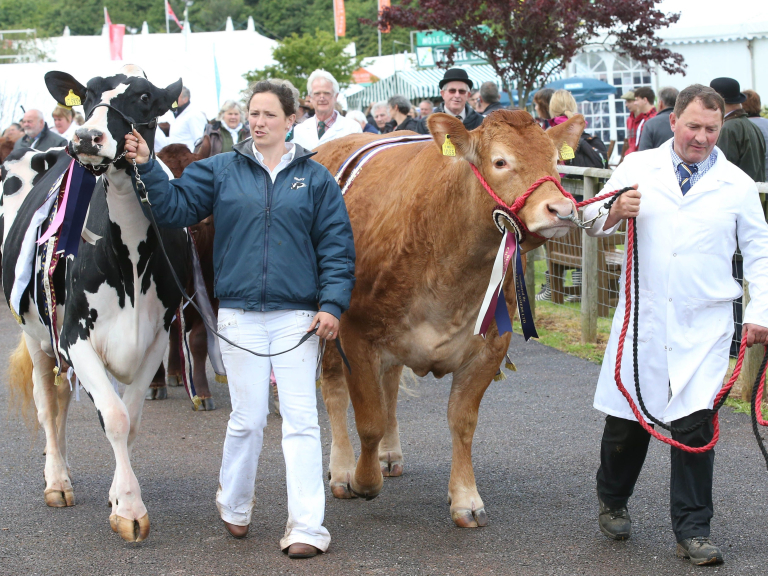 Dairy & Beef interbreed – Nicola Lochyer and Michael Alford with the dairy and beef interbreed champions respectively. 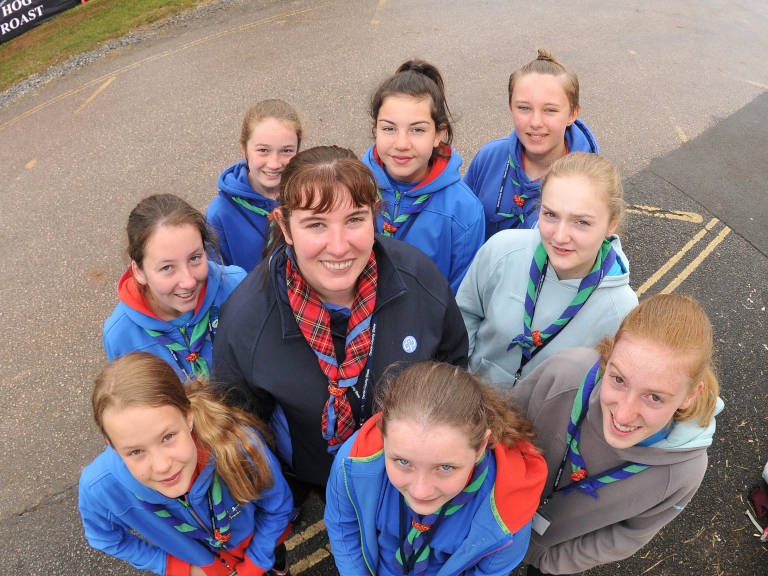 Girl Guides – Newly-wed Girl Guide leader Hannah Richardson surrounded by some of the Guides who help at the Show.